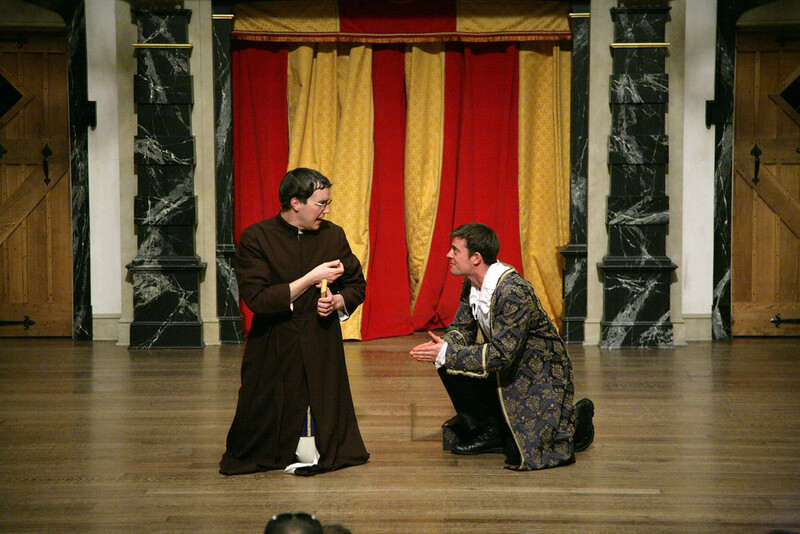 John Harrell and Matthew Sincell in 'TIS PITY SHE'S A WHORE. Photo by TOMMY THOMPSON. 2006. 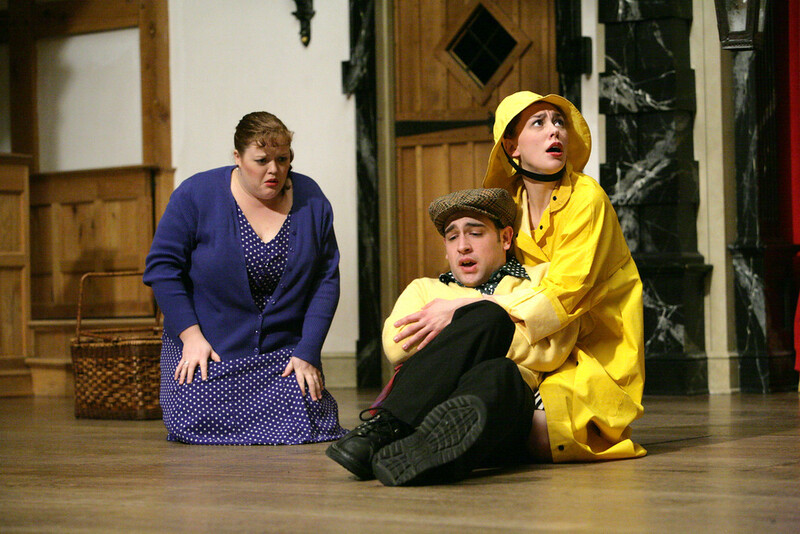 Matthew Sincell and Miriam Donald in 'TIS PITY SHE'S A WHORE. Photo by TOMMY THOMPSON. 2006. 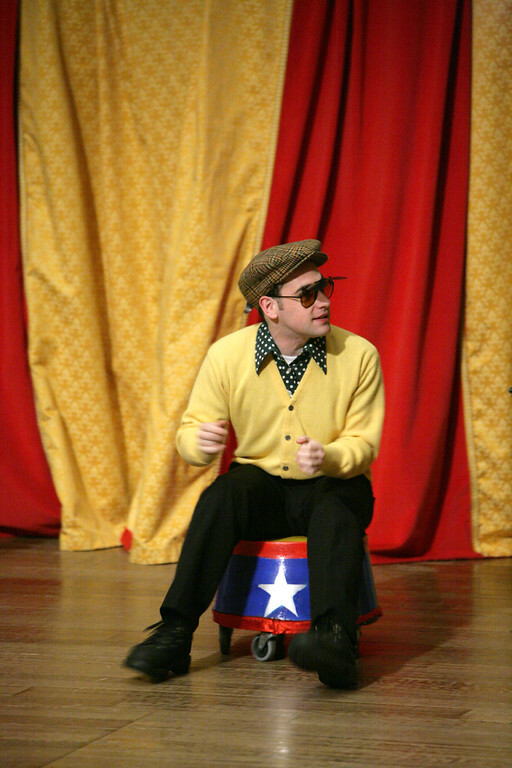 Paul Fidalgo in 'TIS PITY SHE'S A WHORE. Photo by TOMMY THOMPSON. 2006. Miriam Donald and Matthew Sincell in 'TIS PITY SHE'S A WHORE. Photo by TOMMY THOMPSON. 2006. 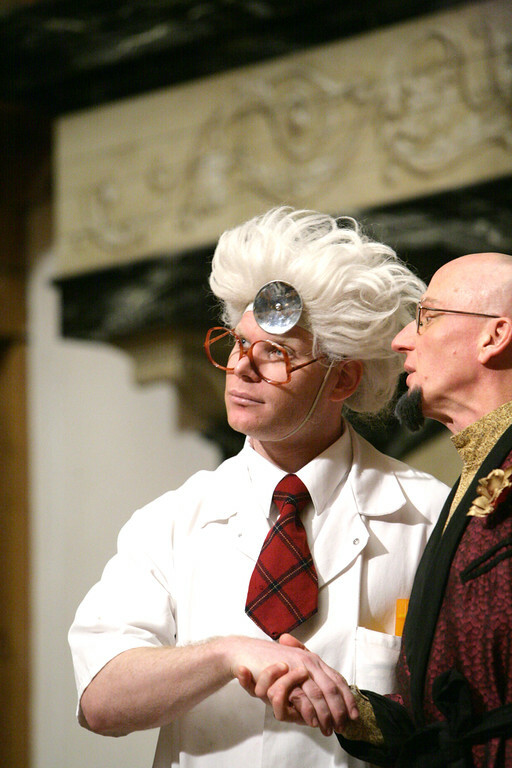 Bernard Bygott and David Loar in 'TIS PITY SHE'S A WHORE. Photo by TOMMY THOMPSON. 2006. Vanessa Morosco and René Thornton, Jr. in 'TIS PITY SHE'S A WHORE. Photo by TOMMY THOMPSON. 2006. 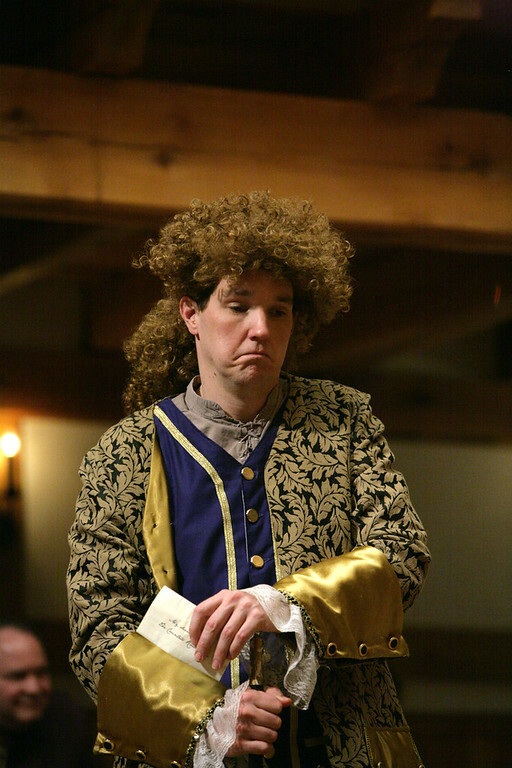 John Harrell in 'TIS PITY SHE'S A WHORE. Photo by TOMMY THOMPSON. 2006. Eve Speer in 'TIS PITY SHE'S A WHORE. Photo by TOMMY THOMPSON. 2006. The cast of 'TIS PITY SHE'S A WHORE. Photo by TOMMY THOMPSON. 2006. René Thornton, Jr., Benjamin Curns, and the cast of 'TIS PITY SHE'S A WHORE. Photo by TOMMY THOMPSON. 2006. Giovanni boldly and unapologetically reveals his incestuous love for his sister, Annabella, to Friar Bonaventura, while Friar urges Giovanni to repent. Annabella’s father, Florio, reconfirms his approval of Soranzo to marry Annabella by breaking up a fight between Soranzo’s Spanish servant, Vasquez, and a rival suitor, Grimaldi, who is a Roman nobleman and kinsmen of the Cardinal. Annabella and her nurse, Putana, discuss the suitors attempting to woo Annabella, including the foolish Bergetto (nephew of Donado, a friend of Annabella’s father). Hippolita’s husband, Richardetto (who is rumored to have died seeking his orphaned niece Philotis), returns to Parma disguised as a doctor while Philotis, meets Annabella and befriends the foolish Bergetto. 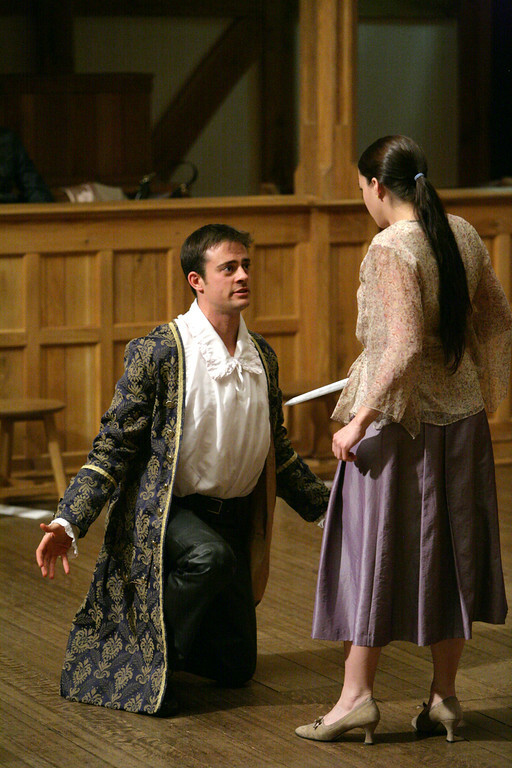 Annabella rejects Donado’s proposal that she marry his nephew Bergetto. Soranzo comes to court Annabella and she falls ill. Putana realizes that Annabella is pregnant; Giovanni tells the Friar; the Friar advises Annabella to accept Soranzo by painting a vivid picture of hell; she agrees to break off relations with Giovanni. Wedding plans, murderous plots, and bloody ends ensue. You could hardly find a more telling comparison between the last decade of the England of Elizabeth and the England of Charles I than Romeo and Juliet (1595) and ‘Tis Pity She’s a Whore (1633). In many ways John Ford’s play is a homage to Shakespeare’s play about young lovers. Here we have the restless, love-struck young man whose ardor is matched by the young woman he’s in love with. Here we have the beautiful words of love. Here we have the priest who is the young man’s confidante. Here we have the meddling nurse who cheers on the young girl. Here we have the young girl forced to wed someone other than her lover. There’s one big difference: in Ford’s play, the lovers Giovanni and Annabella are brother and sister. Does this mean that John Ford was trying to make a familiar plot more sensational? Well, sure. But the play does not wallow in that part of the story. In fact, it draws its strength from an indictment of the corrupt society around the two incestuous lovers. Yes, the beginning of the play shocks us with the commencement of this taboo alliance, but an odd thing happens as the play unravels: in a world of corruption, cruelty, and hypocrisy – the brother and sister become the most sympathetic characters on stage. While Shakespeare lets the world revolve around Romeo and Juliet, Ford brings into ever more focus his play’s other characters and their stories. Everyone is flawed. Annabella’s suitor’s, for example, include Grimaldi, who is quite willing to murder his rivals; Soranzo, who is in an adulterous affair; and Bergetto, who is a rather wonderful idiot. Each of their stories is itself a little play, each is attached to other stories, and all the stories intertwine as the play moves to its ghastly and entertaining conclusion. And at the heart of the play is a changed worldview from the one that informs Romeo and Juliet. That earlier play’s sense of tragedy comes in part from the feeling that the only obstacles to love and happiness for the young couple are a silly feud and bad timing. The world is still a spacious and hopeful place.